Well lets get the story straight for a second. When a company says "Better" your first question should be "than what?". There is no doubt that this battery technology has some really great properties, however does it solve the problems associated with the normal consumer in terms of battery life? Lets see. The major benefit that they are touting is the ability to charge quickly. Very quickly. 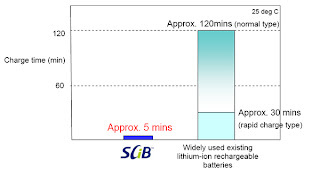 The graph they are showing in the data sheet makes the following comparison: The SCiB battery can charge 6-24 times faster than other Li+ batteries. There are two major applications that would love to see this benefit, handheld devices and electric cars. The technology, according to their data sheet says it can charge at 50 amps. They do not relate this statistic to the size of the battery, so I think it is suspect, but lets just take it at face value. For handheld devices you will not be able to get the full benefit of this feature because most homes do not have circuits with 50 amp breakers on it (there are exceptions, but in general, trying to get 50 amps through a normal outlet will make the circuit breaker go). There are other reasons why this is not a good technology for handheld, but we will get to that later. The idea that you may go to an airport and plug in for 5 minutes to charge your laptop, doesn't seem likely. For electric cars, that have large batteries, this is truly a boon. The possibility of having electric-only service stations are possible. Installing a 50 amp circuit in your garage is completely viable, and you may already be wired that way since many people have big tools like air compressors, saws and so forth in there. But alas, while they have solved one issue, other features of have been made worse. Take a look at the chart to the right. The energy density of the new SCiB is far worse than current Li+ technology for handhelds. So while this may not be so much of an issue for weight and space insensitive applications, like cars, its pretty much a death knell for handheld and portable applications. This leads to volumetric energy density of 130 Wh/l (without any sort of enclosure) and 67 Wh/Kg. Just to take a reality check, lets compare to a product that we already know is bunk, the Medis 24/7. It has an energy density of 85 Wh/L and 130 Wh/Kg. So the SCiB is still better volumetrically (important for integration into handheld devices) but the Medis power pack, is better in a weight basis. Of course using normal Li+ beats both by factor 2x. Regardless, other features that help this new technology is the low life cycle degradation, one of the key deficiencies of traditional Li+ batteries. 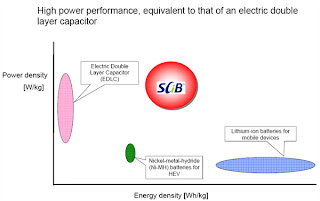 In addition to applications that include battery-powered bicycles, motorcycles, automated guided vehicles, electric forklift trucks and construction machinery, which already use rechargeable batteries, the SCiB is also a promising candidate for emergency power sources, electric power regeneration in wind power systems and stabilization of electric power supply. Application in hybrid cars is also planned, with the intent of extending application to electric cars in the future, after advancing development of a high-performance SCiB cell. And I fully agree with this assessment. Apparently its just the media and bloggers that are getting ga ga over it for handhelds. Just a little correction. You do not need to charge it at 230 V, 50 A. If you take a standard laptop charger operating at 20 Volt, You just need it to deliver 5 Amps at 230 V. This is still a lot (1200 VA). This is as large as a standard heating element. So still a lot but it does not activate your circuit breaker unless you charge 3 laptops at the same time. I think I see what you are saying but you got me a little confused at your units. The 230 volts is not intended for laptop charging. It is for charging cars. A laptop doesn't use anything near 230 volts. However the claim from Toshiba was that it can charge at 50 amps. It didn't qualify it with anything about the voltage, or the size of the electrodes (which is why I think it was too general of a claim). A circuit breaker is rated for amperage at a voltage. These voltages, in America are generally 120V or 220V. So if I am charging a 230V device at 50 amps, I will either attempt to draw either 100 amps or 50 amps from the panel, respectively. If I am trying to charge my laptop at 50 amps (again their claim seems flaky and inaccurate), then I can expect that I will only draw 10 amps from the panel (assuming a 12V charge). That is about the same as a refrigerator. So my point was that, at an airport or something, if more than one person tries to charge their laptop at full speed, its likely to trip the breaker. But you are right, 50 amps into a laptop battery or cell phone would not be 50 amps out of the socket. Each cell is 2.4V. If charged with 50A you'll need 2.4*50/0.8 = 150 VA (assuming 80% efficiency in the converter). The batteries are apparently 10 cells in series, 24*50/0.8 = 1500 VA. Both are feasible on any circuit, at least here in Europe. Hmm, too bad they're heavier than Li-Ion, otherwise it is pretty cool stuff. I'm keeping this one, I'll remove the rest. I think it's a nice way to share experience about New Batteries experiences so it would be helpful for others who are looking for some information about their issues.